In tragic news, Iraqi-born British architect Zaha Hadid died of a heart attack on Thursday at the age of 65. Regarded as “the greatest female architect in the world today,” Hadid was the first woman to win the Pritzker prize. The Guardian and ArtInfo share images of her architectural achievements. Valeria Napoleone discusses her collecting philosophy of buying work only by women artists. Media executive and philanthropist Elisabeth Murdoch launched an annual £100,000 award for a mid-career female artists based in the U.K.
Los Angeles-based photographer Ilona Szwarc documents Texan girls who compete in rodeos. Anoushka Shankar blends sitar sounds with pop music in a response to the trauma of displaced refugees. The New Yorker profiles “the greatest singer in the history of postwar popular music”—74-year-old songstress Aretha Franklin. Novelist Marilynne Robinson is the 2016 winner of the Library of Congress Prize for American Fiction. Hyperallergic reviews the latest production of Jackie Sibblies Drury’s “Really,” in which the play’s three actors and 30-member audience are housed in a plywood box. Photographs, videos, and installations by Linda Tegg remind audiences about humanity’s connection to the animal kingdom. In Rapaciously Yours, South African artist Frances Goodman examines femininity, costuming, and role-playing—through artwork comprised of acrylic nails. Jamaican artist Ebony G. Patterson explores visibility in terms of class, gender, race, and the media in her exhibition at the Museum of Arts and Design. 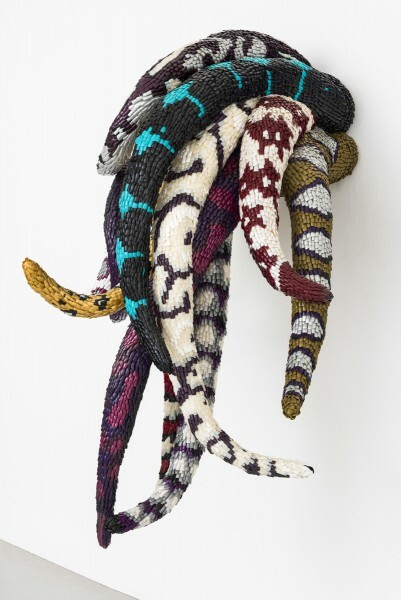 Her highly-adorned objects feature bodily forms camouflaged by floral prints, embroidery, and glitter.